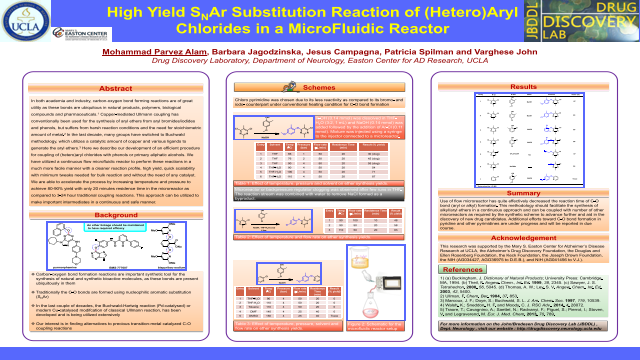 High Yield SNAr Substitution Reaction of HeteroAryl Chlorides in a Microfluidic Reactor” received the sole award from ePosters, one of the sponsors of the Flow Chemistry Congress. The work that resulted in the presentation was funded by the Mary S. Easton Center for Alzheimer’s Disease Research, Department of Neurology, David Geffen School of Medicine, UCLA. Dr. Alam utilized a Syrris microflow reactor to overcome some of the obstacles to continuous chemical synthesis of active pharmaceutical ingredients (API). This new method will not only allow continuous, high-yield of new compounds, it is also considered “Green Chemistry” and part of the emerging field of Flow Chemistry, the focus of the Congress.Summary: This methodology facilitates the synthesis of alkyl/aryl ethers in a continuous approach and can be coupled with number of other microreactors as required by the synthetic scheme to advance further and aid in the discovery of new drug candidates. References: 1) (a) Buckingham, J. Dictionary of Natural Products; University Press: Cambridge, MA, 1994. (b) Theil, F. Angew. Chem., Int. Ed. 1999, 38, 2345. (c) Sawyer, J. S. Tetrahedron, 2000, 56, 5045. (d) Thomas, A. W.; Ley, S. V. Angew. Chem., Int. Ed. 2003, 42, 5400. 2) Ullman, F. Chem. Ber. 1904, 37, 853. 3) Marcoux, J. F.; Doye, S.; Buchwald, S. L. J. Am. Chem. Soc. 1997, 119, 10539. 4) Walsh, K.; Sneddon, H. F. and Moody, C. J. RSC Adv., 2014, 4, 28072.